A quick note to share the new kits I just posted in my web shop. Whew! Say that 5 times fast! I’m cleaning out my craft closet, which means I gathered all my random bits and pattern pieces and put together some discounted surprise samplers. What fun! For me and hopefully for you, too. 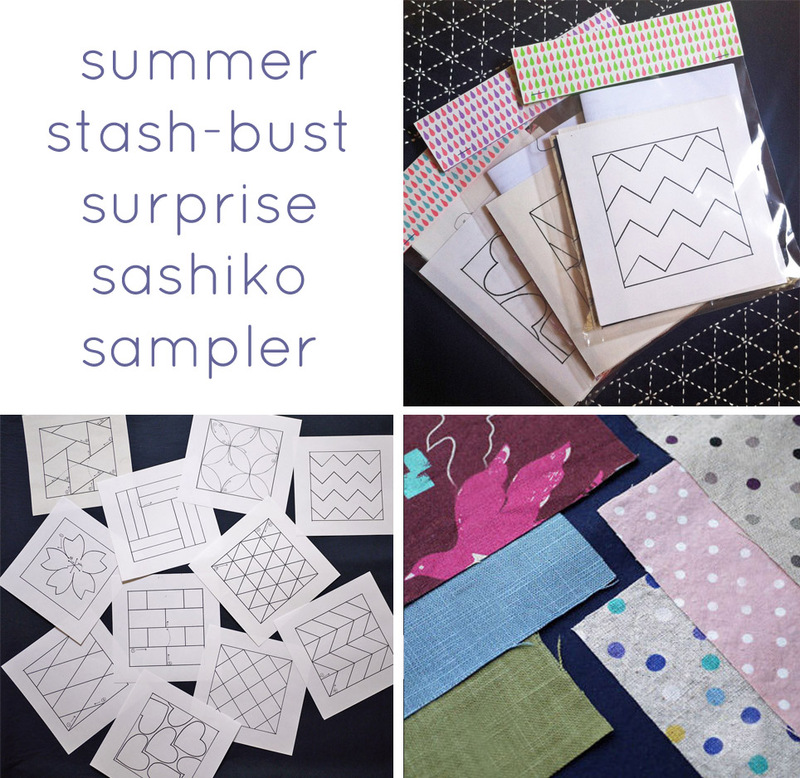 This sashiko grab-bag includes everything you’ll need to make 4 coasters, including a surprise selection of patterns and fabrics. You’ll get a random yet well-coordinated assortment. Let’s get a little sampler-dangerous. More info on the kits here. Thanks! Spring has taken hold of me. 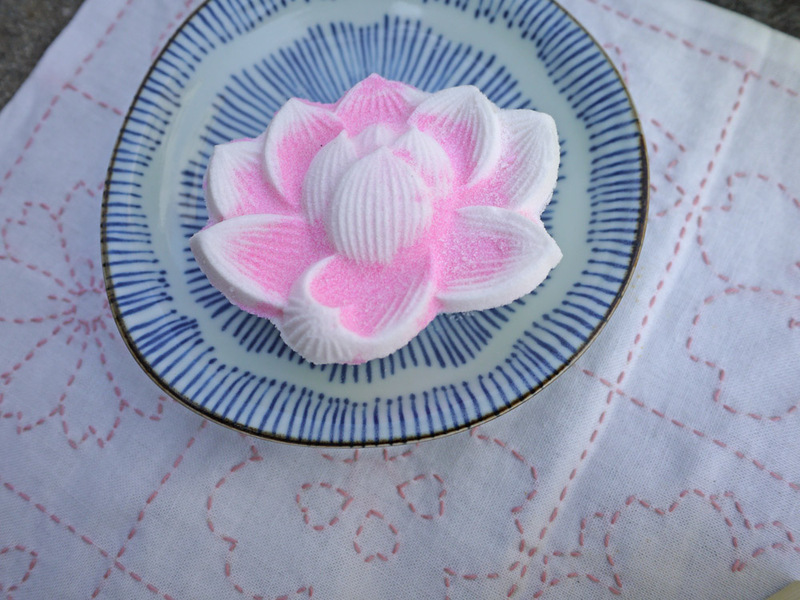 I ate two sakura-flavored mochi today. No lie. 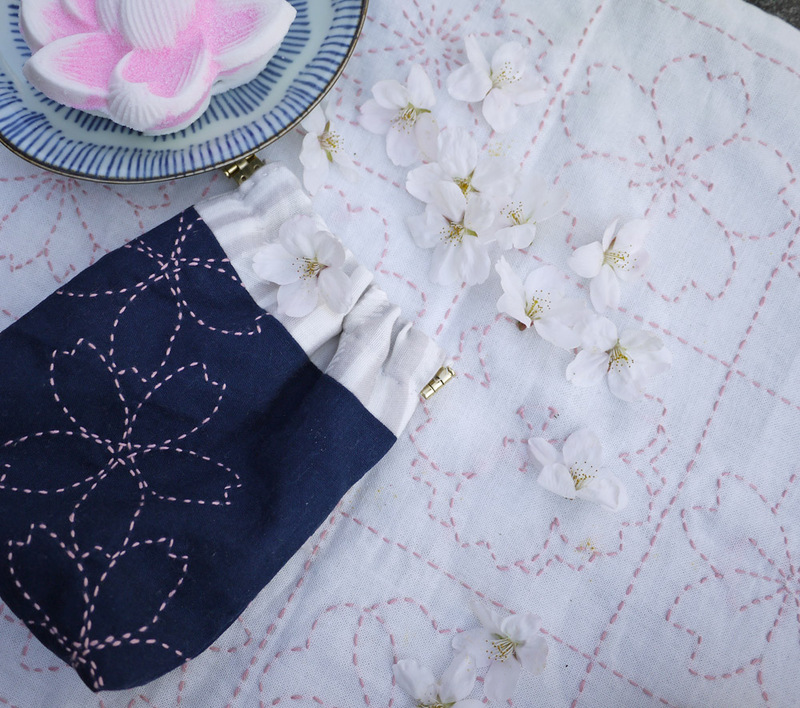 Every year I put out a sakura-themed sashiko kit because I think sakura and sashiko are such as lovely little pair. And they are fun to say. 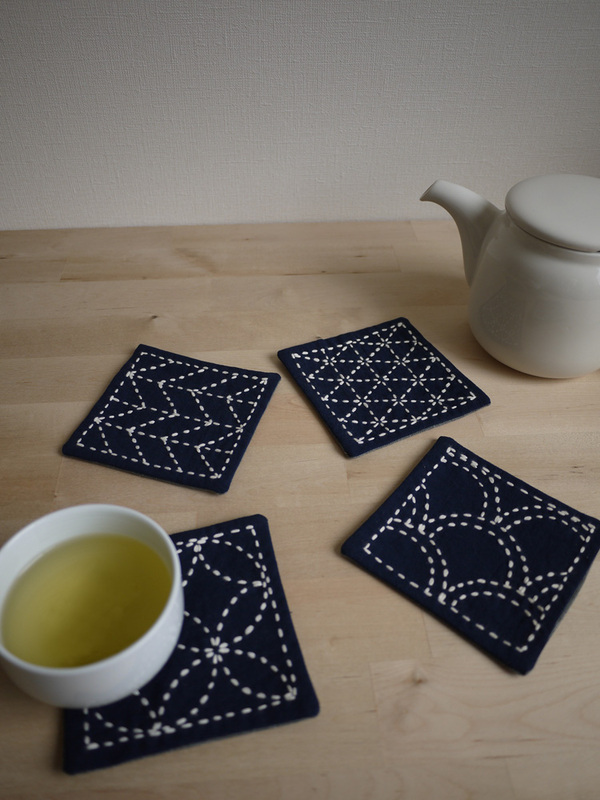 Go ahead and try it: sakura sashiko sakura sashiko sakura sashiko. Catchy, right? This year I designed a pouch kit. These metal squeeze clasps are a new discovery for me and they are great. Easy to use, the metal clasp stays closed tightly and makes such an interesting and unexpected detail. 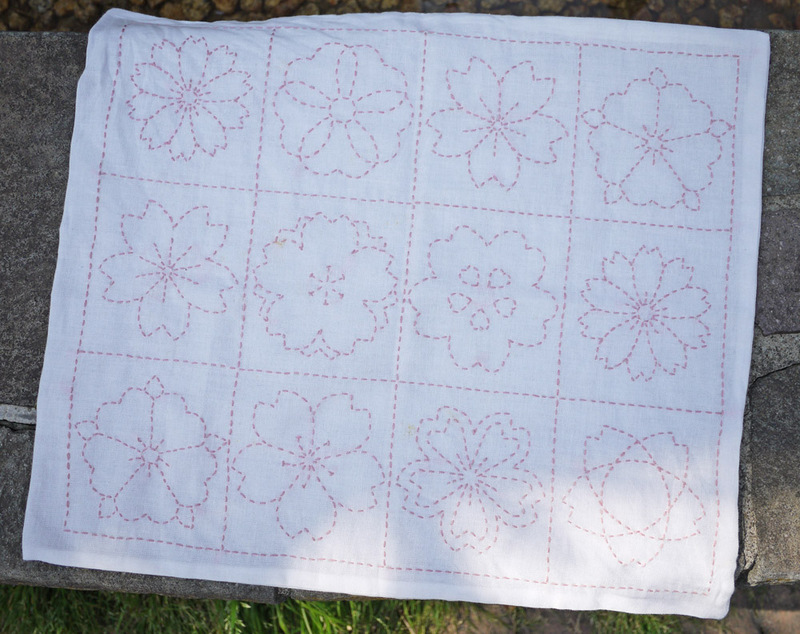 This sashiko kit is easy to assemble in an afternoon and can be sewn entirely by hand. 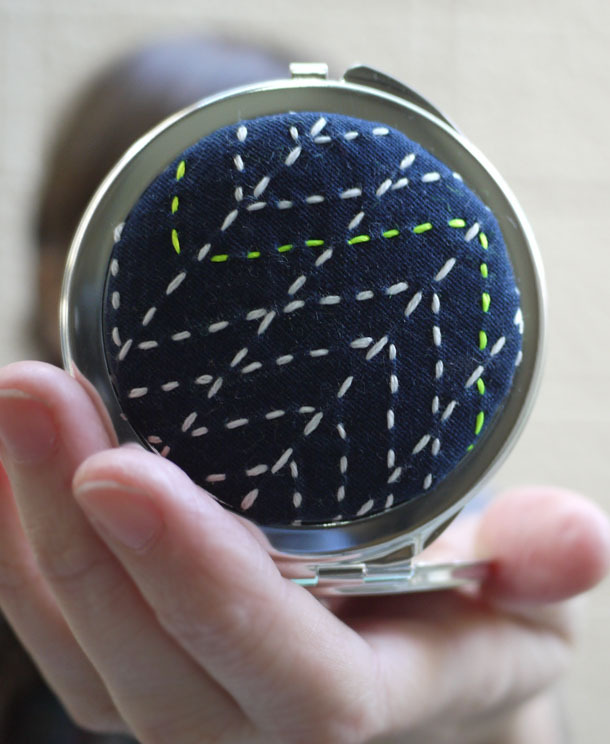 It is a great kit for beginner embroiderers, too. 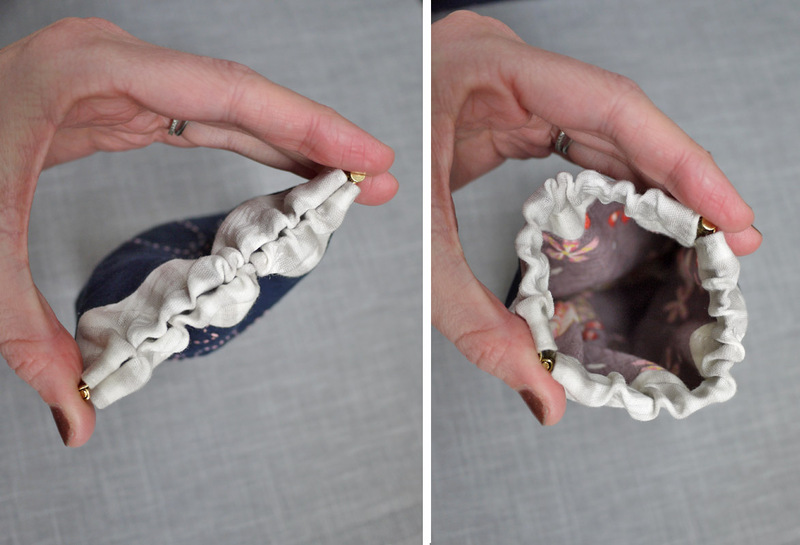 The finished pouch is 5″ by 6 1/2″ (125 mm by 165 mm), perfect for cosmetics, jewelry, small toys or treasures. 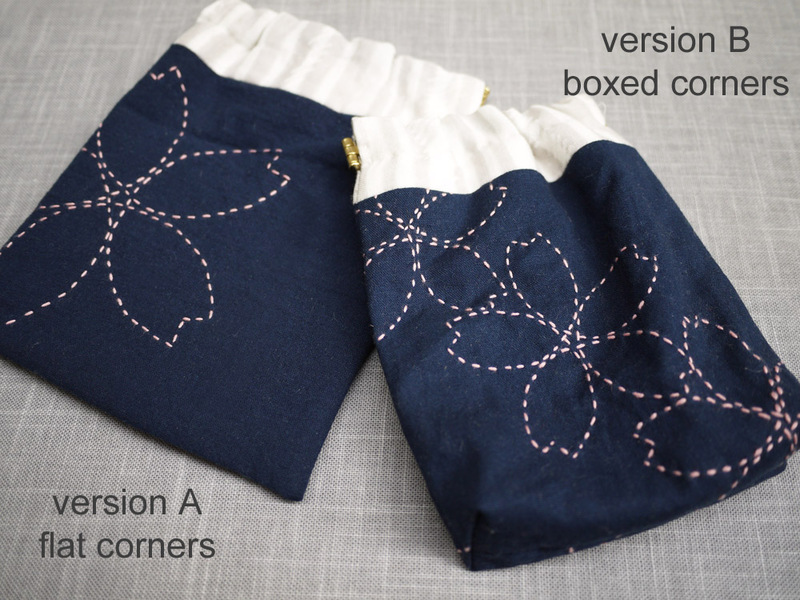 Both small and large sakura patterns are included so you can design the layout yourself, and the pouch can be made with flat or boxed corners, your choice! You can find the kits here. I hope you enjoy them as much as I do! Today the weather was beautiful. I packed a lunch, hopped on my bike and peddled out for an impromptu picnic. 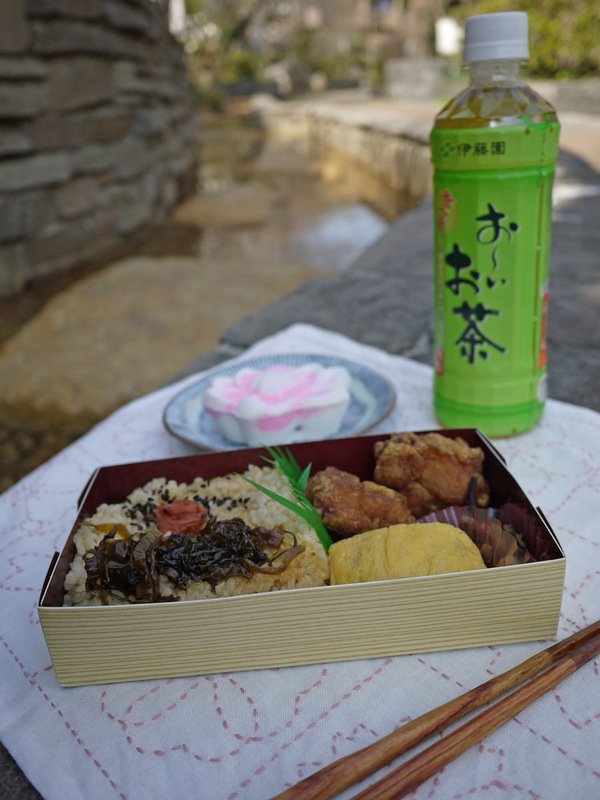 My neighborhood has a take-away karaage (fried chicken) shop which proves irresistible at lunchtime when they stack bentos in the front window. Next door is a sweets shop, so into my bike’s basket went a sakura-shaped sugar cookie for dessert. The sakura trees are just starting to bloom in Tokyo. I found a few over-achieving blossoms that had already fallen and scooped them up to take along. The wasanbon cookie was stuffed with azuki red bean paste and much too sweet for my liking. It looked pretty anyway. The footpath that runs through Setagaya is lined with small gardens, play areas, and occasionally a small stream. 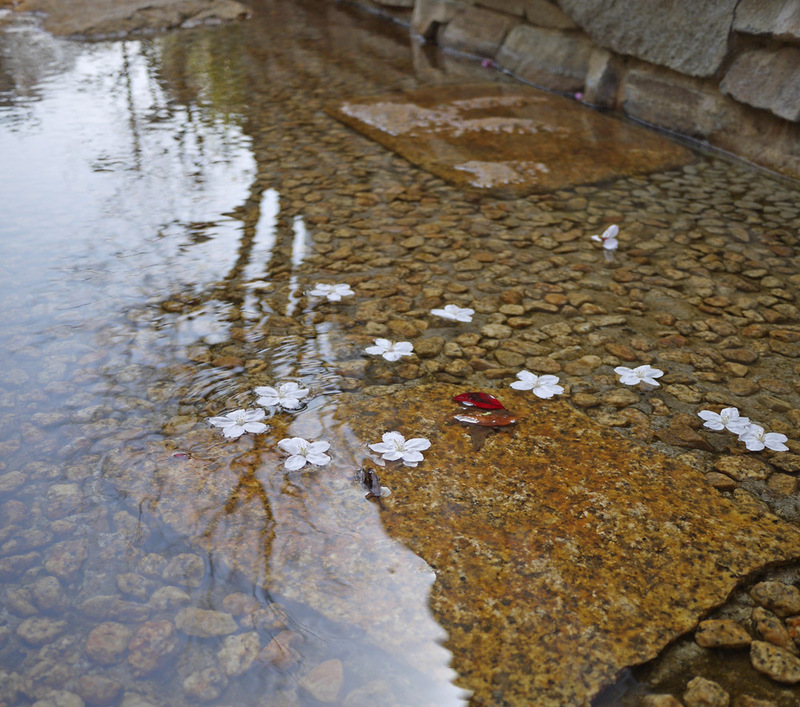 As I ate my lunch I dropped the blossoms into the water. They meandered about 5 or 6 meters before getting caught on a rock. A bit later a small girl noticed them and plucked one out, very proud of her find. Ah, spring. Yesterday I shared last year’s to-do list and how well I did checking things off. 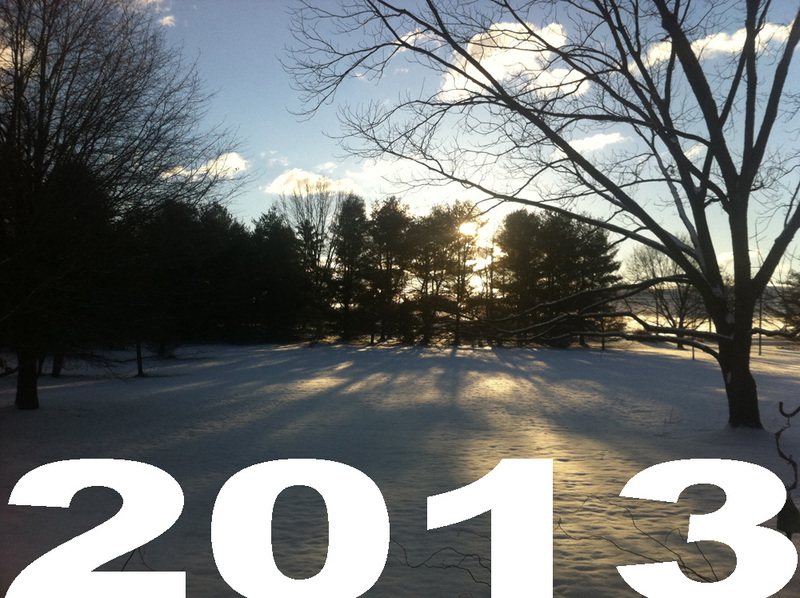 It feels good to keep a list and look back a year later, to see how your year changed from the one you had imagined. I might not have accomplished everything on my list, but keeping an eye on it throughout the year gave a good push to keep trying new things. Cook 12 new recipes. I am putting this on the list again, even though last year I failed miserably at it. I want to cook more, and if this list gives me even a little bit of encouragement it will be a positive gain. 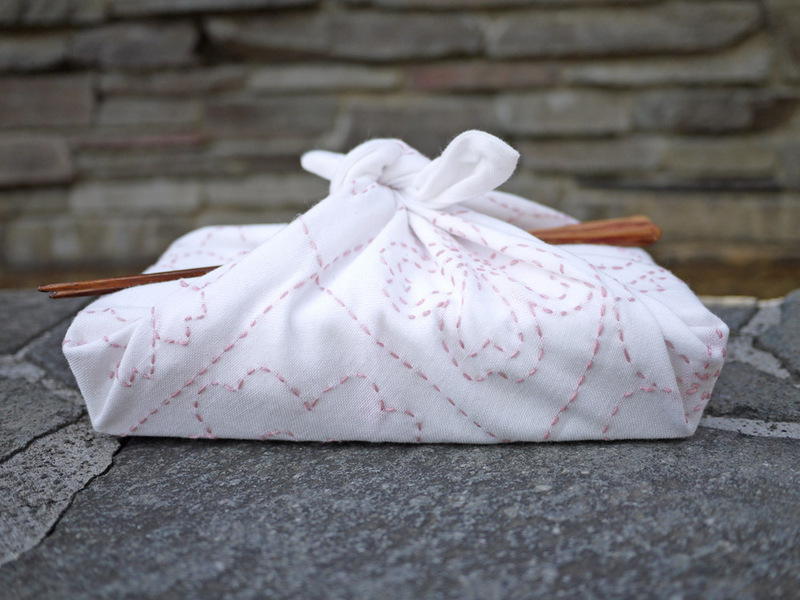 I’d love to learn more traditional Japanese dishes, so perhaps I’ll even treat myself to a cooking class. Read 8 books. I’m upping the ante from 5 last year. Recommendations? Visit 6 new places. This is achievable so I’m sticking with it. If I could go anywhere? The mountains of Chile, Alaska, New Zealand. Where might I go? Vietnam, Cambodia, Thailand, or a romp through northern Japan. I’d love to find a hike to a secret little outdoor onsen in the mountains. Sew 6 new garments. My new sewing hobby has me obsessed. I’d like to learn more skills this year, and make a fitted and lined dress, pants, and a jacket or blazer. I vow to not be afraid to cut into expensive fabrics. 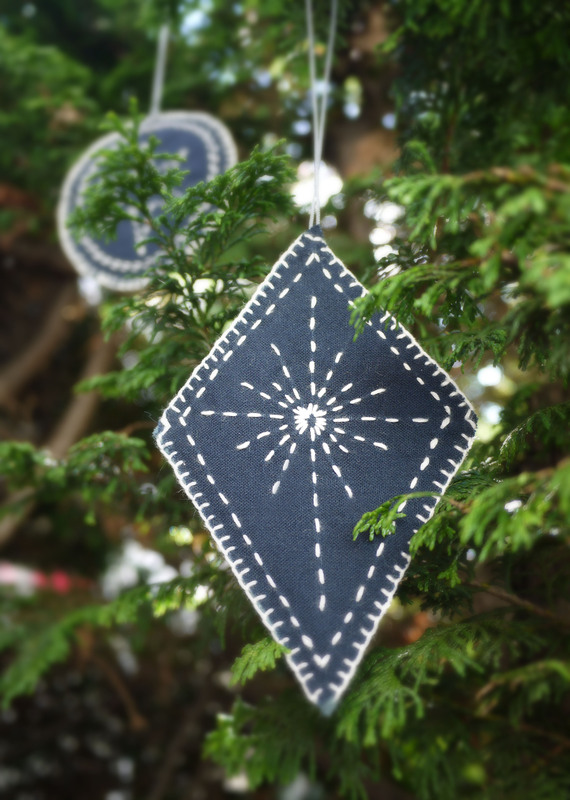 Make a gigantic sashiko art piece. A last-minute addition. Why not?! Publish something. An article or an encyclopedia (dream big! ), it doesn’t matter. Perhaps you’ve already finished your holiday crafting. Me? I’ll be stitching until 2 am on Christmas Eve. I do it every year, no matter how much planning or preparation I’ve put into my projects. Now I prefer it this way. A quiet Christmas eve, low lamp light, warm tea and hand stitching. Hello! Just a quick note to share that today is the last day for worry-free delivery by December 24th for purchases from my online shop. 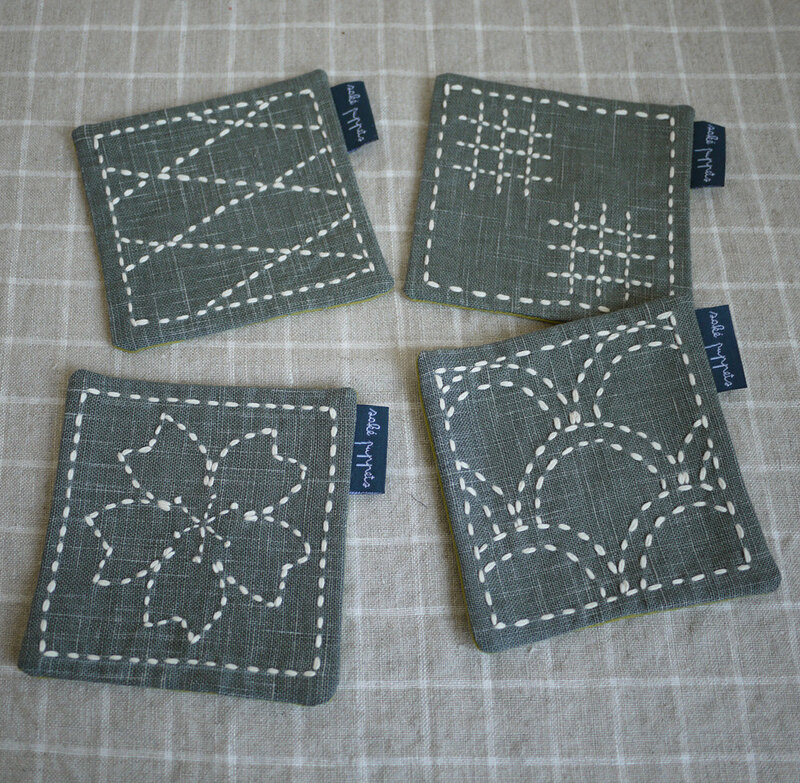 There are still many sashiko embroidery kits and a few gift items available, so please have a look if you fancy. Also, use the coupon code CHEER for 10% off your purchase! Not to worry, express shipping is available until December 17th. Need some help deciding? Check out my gift guide for inspiration. The holiday season ’tis upon us again. Tokyo is blanketed in tiny LED lights and Colonel Sanders has donned his holiday Santa hat. The Christmas spirit and the smell of fried chicken are in the air! My web shop will be offering Black Friday/Cyber Monday specials again this year, so I encourage you to take a peek! For all orders placed between Friday, November 23rd and Monday, November 26th use coupon code CHEER to receive 10% off your order and to receive a special little surprise gift in the package. It might be edible. It will definitely be weird. Orders will ship Tuesday morning and will arrive in plenty of time for Christmas. Need a little help with your holiday shopping? I’ve taken the liberty of putting together a holiday helper guide. Friends, see if you can guess which one of these are you. For the Crafty Teen :: Maybe they’re too smart for their own good, or maybe they just like to glue sh*t to other sh*t. Perfect for the girl who loves to mix and match accessories and colors and multi-color nail polish. Or for the full-grown woman who also loves these things, including dressing like a teen. For the Busy Mom :: They love to create but have troubling finding the time, because, you know, they are busy keeping tiny humans alive. 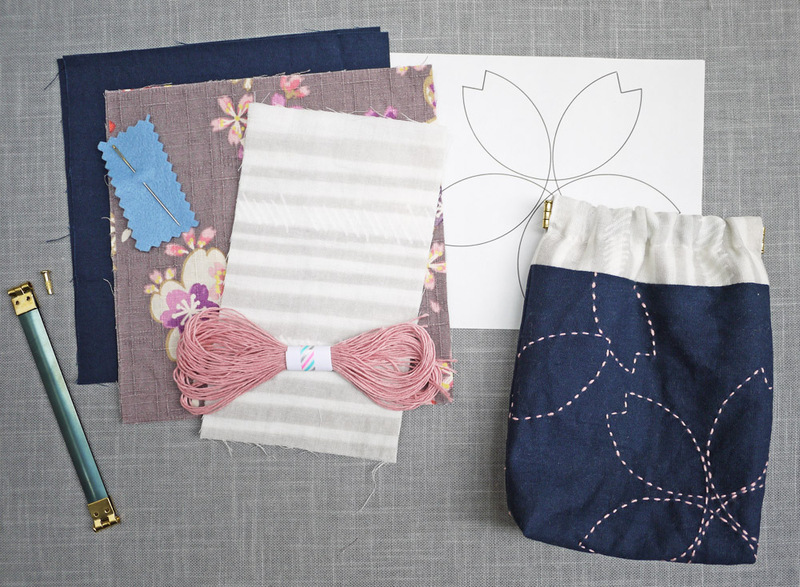 These sashiko kits come with all the materials needed for a full project, and are easy to start, set aside, pick back up again, and finish by dim lamp light in the middle of the night. 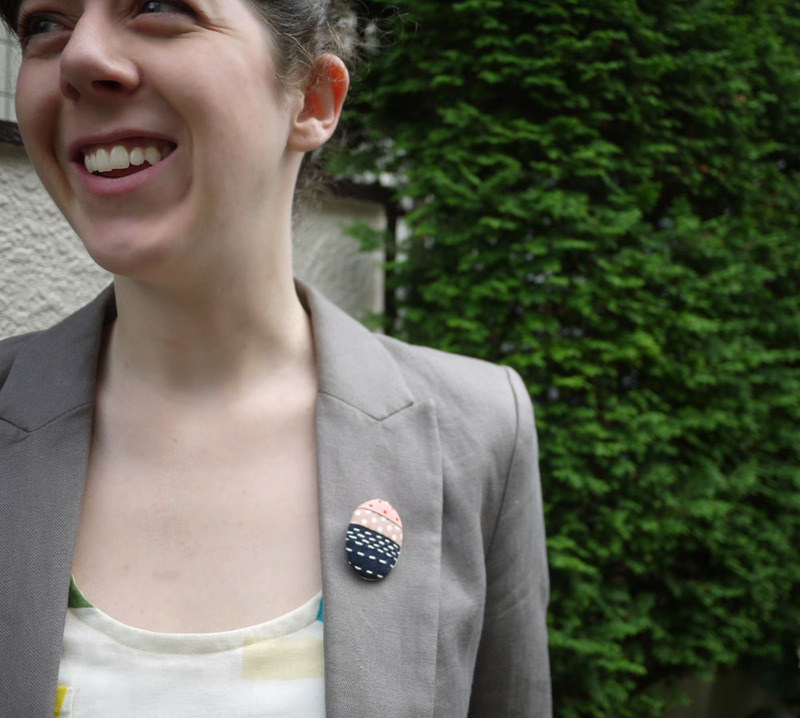 For the Friend Who Always Throws a Better Party Than You :: Wine parties, knitting parties, and impromptu I-just-threw-this-delicious-hotdish-together parties, she does it all. This friend enjoys creating a fun atmosphere for her loved ones and is very good at it, so the special touches really matter. For the Girl Who is Just a Friend :: You don’t want to give the wrong impression, like the time you gave her holiday-themed socks and you found yourself in an awkward position. You also know ladies love presents and you don’t want to take the heat the next time you introduce her to your new girlfriend, and she tells New Girlfriend how awful you are at gift-giving. Because you care enough to say you know she knows you care how she looks. For the Inoffensive Coworker :: You like your colleagues but perhaps you don’t know much about them. Or maybe you do and pretend you don’t. A hand-stitched gift for an inoffensive coworker is the perfect way to say, “Have a fine holiday. But not too much fun that you run off and leave me with all this work.” Also, these ornaments are fun to make, so you might as well get something out of the deal.